Fits 430 Series Vacuums using the DCF-10 Filter. This filter has now been replaced with the Eureka DCF 14. If you order this filter you will receive a DCF 14 Filter. It will fit your machine the same as the DCF 10 but will have supperior filtration. 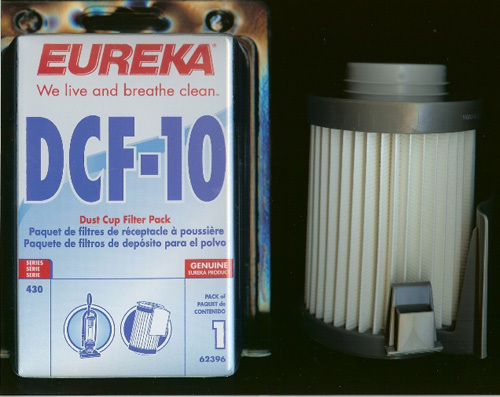 Eureka disposable filters are guaranteed to be free from defects in material or workmanship. If for any reason the paper filter bursts, or tears under normal household use, Eureka will replace this package at no charge. Should a defect occur, please return package with proof of purchase and the defective filter to your local Authorized Eureka Dealer for replacement.